One of these treatment approaches is the therapy with autologous conditioned serum (ACS), which was developed by two German medical researchers, orthopedist Prof. Dr. med. Peter Wehling and molecular biologist Dr. Julio Reinecke of Düsseldorf, in collaboration with Prof. Christopher Evans of Harvard University and Prof. Paul Robbins of the University of Pittsburgh. In ACS-therapy, immune proteins that fight pain and inflammation are produced from the patient’s own blood. These immune proteins – blood proteins that play a role in the functioning of the immune system – have the ability to reduce the pain and improve joint mobility. While this treatment is used primarily for osteoarthritis of the knee, hip and other joints, the same approach can also be used to treat back pain, with excellent results. University hospitals both in Germany and abroad have had positive results with these new therapies. Clinical studies show that treatment of osteoarthritis and back pain with ACS is safe and effective. Osteoarthritis is part of the natural aging process that affects us all, as it is normal for the cartilage in the joints to break down over time. Osteoarthritis often develops very slowly over many years, and only ­becomes painfully debilitating when damage to the joint has already occurred. Osteoarthritis can affect any of the body’s joints, ­particularly the knee, hip and hand joints, as well as the joints of the spine. Osteoarthritis can be triggered by a variety of factors such as excessive stress on joints due to over-use, poor posture, muscu​loskeletal misalignment or sports injuries. directional stresses and strains to which they are subjected, it is hardly surprising that the knees are more likely to be injured or wear out than any other joint in the body. The knee joint works like a hinge: it can bend (flex) and straighten (extend), and it also rotates slightly to allow the lower leg to turn in or out. The joint is formed by the ends of the femur (thigh bone) and the tibia (shin bone). The bone ends are covered by a layer of elastic cartilage (articular ­cartilage) that acts both as a bearing, allowing the bones to slide freely on one another, and as a shock absorber. The ends of the bones and the cartilage are enclosed by an articular capsule. The inner layer of the capsule, the synovial ­membrane, contains many nerves and blood vessels. It produces a fluid (synovial fluid) that lubricates the joint and nourishes the cartilage. 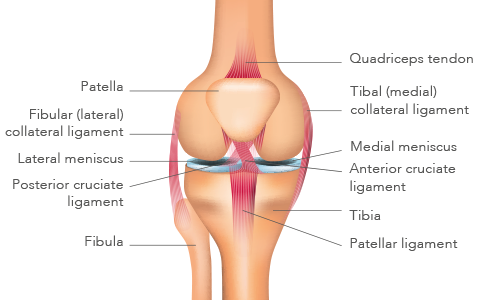 The medial and lateral collateral ligaments, located on the inner and outer sides of the joint, provide lateral stability when the knee is extended. The anterior and posterior cruciate ligaments cross in the center of the knee and limit the joint’s rotational or twisting motions. The meniscus, or meniscal cartilage, consists of two crescent-shaped cartilage discs, the medial (inner) and lateral (outer) menisci, that provide improved contact and cushioning between the ends of the femur and tibia bones. Most importantly, they distribute the weight of the body over a larger surface area and thus reduce the pressure on the articular cartilage. In a healthy knee, as much as 50 percent of the load on the joint is transferred to the menisci, thus reducing the pressure on the articular cartilage by half.